Harry teaches Daphne some self-defence. Charles invites Wally to risk a half-share in the Coffee Shop in a poke game. A very tense hand is underway. Wal suggests upping the stakes to 51% - which would make Harry the boss. 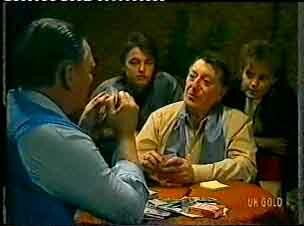 Harry appears to be quite worried by the way things are going, but he's a hustler - he's got 4 Kings - he's won! 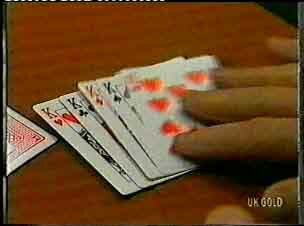 Daphne is suspicious that Harry is actually a master poker player! Wally is showing Harry around his new business. Wal has taken it quite good-naturedly - in fact, the Coffee Shop is mortgaged to the hilt and it's very difficult to pay the bills! Terry comes round and Daphne hustles Shane out! Terry tells Daphne that she's seen Charles's car at the end of the road- he's worried that he'll hurt someone. Daphne is horrified that the tape is at the Robinsons house - they'll have to get it to a solicitor in the morning. Daphne tells Terry that she can stay over with her tonight. 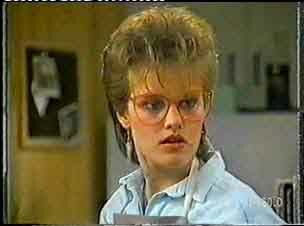 Barbara comes in, having been out doing surveillance in Ramsay Street. They are desperate to get the tape back. Daphne is tackling Harry about his hustling. Harry says the only thing he's won is a $50,000 mortgage! Just then, Eileen comes in looking for Des. Harry introduces himself and asks her to advise him on some wallpaper designs. 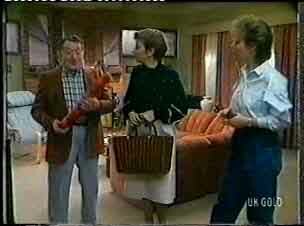 He shows her a hideous red pattern and Eileen lies and says she likes it(!) She says he should choose something washable if he's going into the catering trade. They sit down for a chat and Harry advises her to patch things up with Max. HARRY: Charming woman, Des's mother! 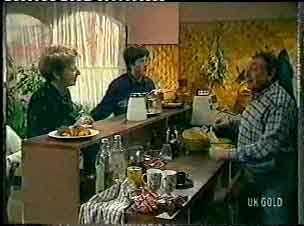 Eileen creeps in to find Shane washing the dishes. She gives him the key to the house back. She starts saying how much she's going to miss being their housekeeper, but Shane reckons that Max's mind is made up. She tries to enlist Shane to put in a good word for her, but he doesn't think it's a good idea. 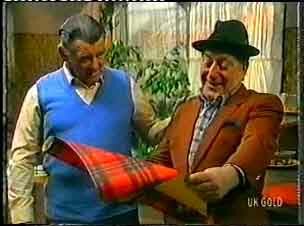 Harry is showing Wally the hideous tartan wallpaper and telling him about his plans for a grand piano and a dance floor! Terry has come to retrieve the tape, but it's not in its case. Eileen comes in to "see how the Coffee Shop is going" As she chats to Harry, a bloke comes up to complain that he's been served a meat sandwich rather than a salad sandwich - and he's vegetarian. He starts to get run off his feet. Eileen sits at a table and talks to Lucy. Scott offers his services to Harry in working after school, but he thinks Harry needs someone full-time - at least to start off. 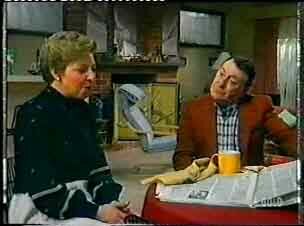 Harry thinks that's a good idea, so he goes to sit at the table with Eileen. He offers her a job. When Daphne has gone, the phone rings. It's Charles on the phone. Terry begs him to leave her alone. CHARLES: Stop playing games, Terry. You're one of life's losers - you and Gordon. He's behind bars and you're almost as good as dead. Terry reckons that Charles will just give himself away if he murders her - it's not as if she's some forgotten junkie or criminal. CHARLES: I've had enough of you. Get the tape and bring it to me now. TERRY: I thought you had it?! TERRY: I haven't got the tape! CHARLES: I don't believe you. Charles hangs up and tells Barbara that he won't let Terry muck him around anymore. He gives Barbara a key. CHARLES: You know what to do. HARRY:(to Lucy) It's only her first day. Maybe she's got a bit tense. LUCY: She's always a bit tense! Scott and Lucy are walking along talking about Eileen's new job. They start chatting about Helen and Lucy talks about how much she's going to miss her. Lucy decides to go and play at the park, so Scott goes on home. 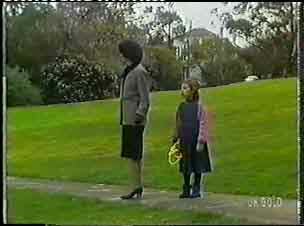 Barbara is in the park and tells Lucy that she's lost her dog. Lucy offers to help her look. 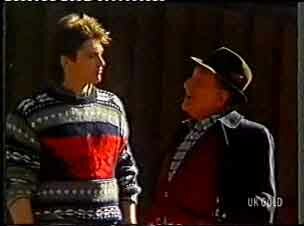 Harry tells Shane that he thinks he's made a mistake in employing Eileen - she's already driven most of the customers away. Shane reckons he needs someone younger with a bit of fun in them. Harry says he knows the very person. Daphne is clipping a bonsai tree when Harry comes in. He talks about how unsuitable her current job is and offers her a job in his Coffee Shop. DAPHNE: You made your bed, grandpa, you can lie in it! HARRY: With Eileen. What a terrible thought! Terry comes round and Daphne hustles Harry out. HARRY: If you see Des, tell him I feel sorry for him. I never realised what that poor boy had to suffer! Terry is frantic about the tape. Daphne hopes the Robinsons haven't played it - or recorded over it. Terry's still worried that Charles will hurt someone. At that moment, Scott rushes in through the back door. SCOTT: Have you seen Lucy? I can't find her anywhere. She was due home ages ago! Cold fear grips the hearts of Terry and Daphne. Barbara and Lucy are still "looking for the dog". Lucy says she has to go home, but agrees to Barbara's offer of a lift.